* 1x Master + 4x Target Independent e-MMC/eMCP sockets. * Supports e-MMC BOOT-1/2, General Purpose-1/2/3/4, and User Data Area Partitions as well as EXT_CSD register settings copy and verify operation. * Supports MMCA 5.0 compatible e-MMC/eMCP devices. * Supports e-MMC 4-bit mode working. * Copy/Verification operation in Partition / Auto / File / Mirror / User / AutoScan mode. * On-the-fly checksum generation during verify operation. * Provides EXT_CSD setting checksum info. * Supports enabling SANITIZE register setting function for MMCA 4.5 e-MMC. * Supports boot re-size function with e-MMC equipped with boot re-size function. * 2x RS232 interface for industrial platform connection. * Replaceable e-MMC / eMCP device socket module is available. * Equipped with 1 SD card socket module for firmware update requirement and log recording function. 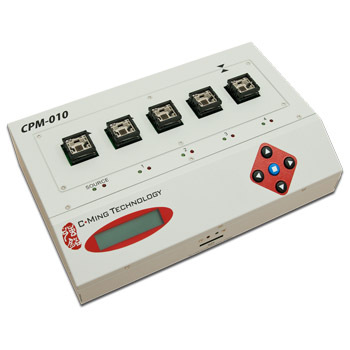 * Equipped with operation LOG recording function (on SD card socket) to save all operation process into LOG file for future study or analyze use. * Equipped with RTC unit for providing operation LOG detail time info. * Equipped with Keypad lock function to prevent settings being changed during operation.